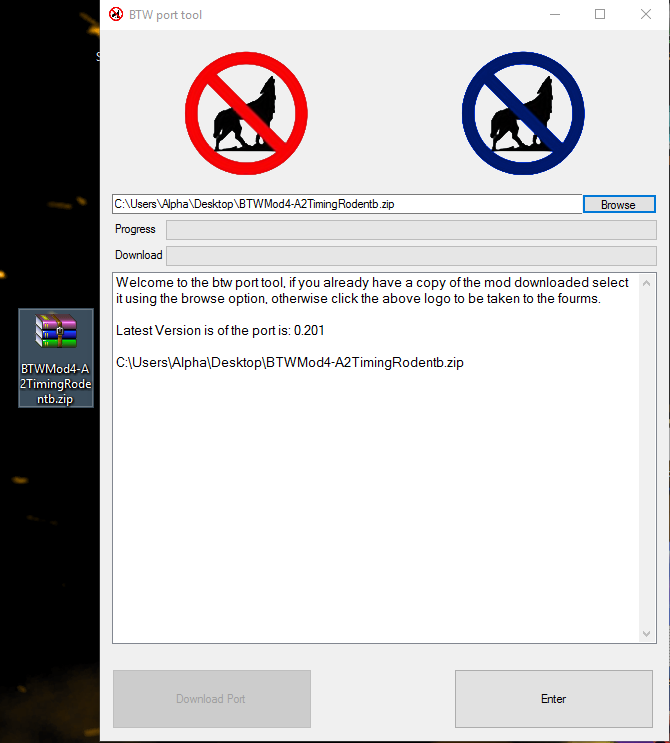 All the the files needed to make this port work are stored remotely on MediaFire and will be downloaded when you launch the tool, it will not function without network access. -Added Gears as an item. -Added Hemp Fibers as an item. -Added Scoured Leather as an item. -Added Donuts (cook flour in the cauldron with sugar). -Added a new block type: Cauldrons. -Added Flour as an Item. -Added ability for Mill Stone to grind Wheat into Flour. -Added smelting recipe to bake Bread from Flour in the furnace. -Add the Omni-Slab in wood and stone varieties. -Add the Hand Crank as a new block type. mod-packs or whatever count as redistributing and are not permitted. All mods created for Minecraft are subject to the EULA. Modding Minecraft is fine, modding a Minecraft mod is also permitted. The copyright of the BTW mod is in this case superseded by the Minecraft EULA, however i have included it for reference. This document and the files contained in this package are Copyright ©(2011, 2012, 2013, 2014, 2015, 2016) and are the intellectual property of the author. All rights reserved. It may not be reproduced under any circumstances except for personal, private use as long as it remains in its unaltered, unedited form. It may not be placed on any web site or otherwise distributed publicly without advance written permission. Decompilitation and reverse engineering is strictly prohibited without advanced written permission. Use of this mod on any other website is strictly prohibited, and a violation of copyright. Are the buttons "Enter" and "Download Port" meant to be grayed out on startup of the program? Edit 2: There seems to be no way to get the axle block to function. M̋͡ủ̯͜c̛͘h ͋ͬd́̏̄i̔̅s̙̯̿tơ̺ͅṙ͉t̾̇͡. ̾V̠̠e̛r̶͕̗y̧ ̡wͩaŗped̫.̶̒͆ ̶W̺ơ̖w̹! Currently forge does not allow entities to be registered, due to changes in 1.11 so until that happens i can't really do waterwheels or any of the other power sources, however i will look at making some kind of temporary solution now. Edit2: also ended up updating the port tool as a bug in my code was causing it to crash when attempting to preform an update. Hey I was so busy with Christmas and New Years I completely forgot about this! Hey there! How's progress going on?